The Nokia CES 2012 keynote has just closed up and with it came the announcement of the Nokia Lumia 710 and the Nokia Lumia 900. Along with the device announcements Steve Ballmer showed up to talk about the great progress being made with the Microsoft-Nokia partnership, and AT&T CEO and President Ralph de la Vega also showed up for some quick words. Continue reading for all the keynote details. The Nokia Lumia 710 Windows Phone is one of the many expected “low tier” devices to be released by Nokia. 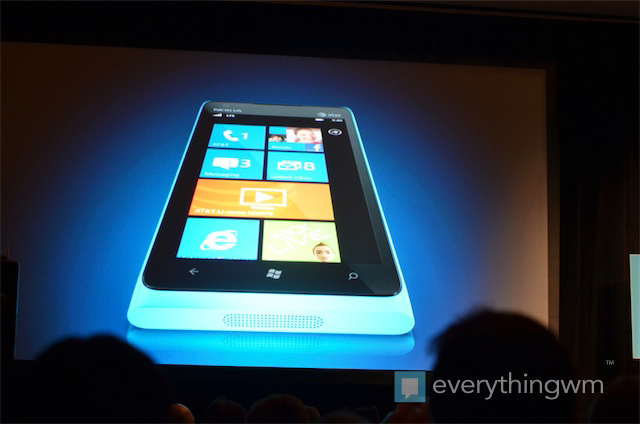 The 710 was announced to launch January 11, 2012 with T-Mobile, no word on any other carriers. The device will be priced at $49.99 and we assume that price is with a 2-year contract as usual. The Nokia Lumia 710 boasts a ClearBlack display with a 3.7″ touchscreen, 5 MP Auto Focus, LED Flash and HD Video rear camera, 4.4 ounces in weight, 8 GB internal storage, 1.4 GHz processor and a 2.4 MP Front Facing Camera. Available in all black color or two-tone white front with black rear colors. 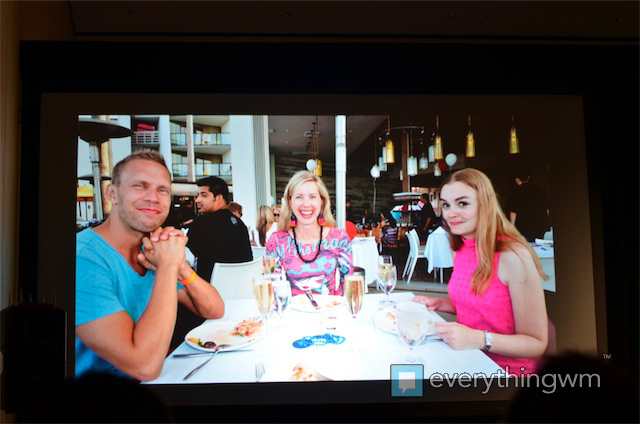 The big announcement, the Nokia Lumia 900 was definitely a device to awe at. 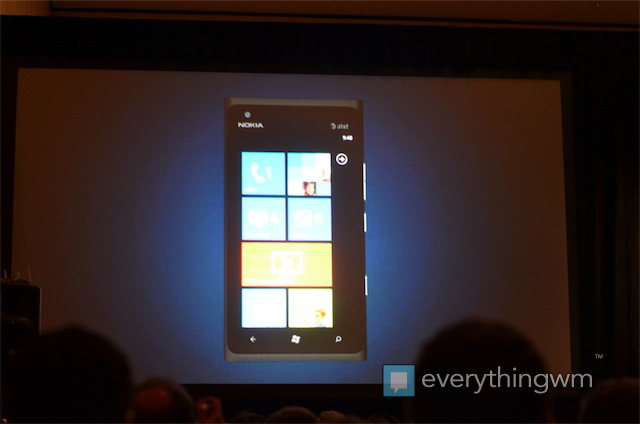 It will be the first 4G LTE Windows Phone and will be launched exclusively on AT&T in the United States. It is the first real Windows Phone intended for the Unites States market. There was no release date announced during the keynote, but more information is promised in the coming weeks on pricing and release. However, the announcement came with much information on what the 900 is equipped with. Initially, the device will be available in black or cyan color. 4.3″ ClearBlack AMOLED touchscreen display with “polarize technology”, 1.4 GHz processor, 4G LTE with excellent antenna performance, 1830 mAh battery, weighs 5.6 ounces, 8 MP Carl Zeiss rear camera with Dual LED Flash and Auto Focus, polycarbonate single body build and 1 MP front camera. Both cameras on the phone have a wide aperture for pictures, showed off exactly what that means for users. With the wide aperture design on both the front and rear facing cameras of the Lumia 900, it allows for the user to capture much better quality pictures, and not only that, but it creates a wider angle to capture more of what you are looking at. 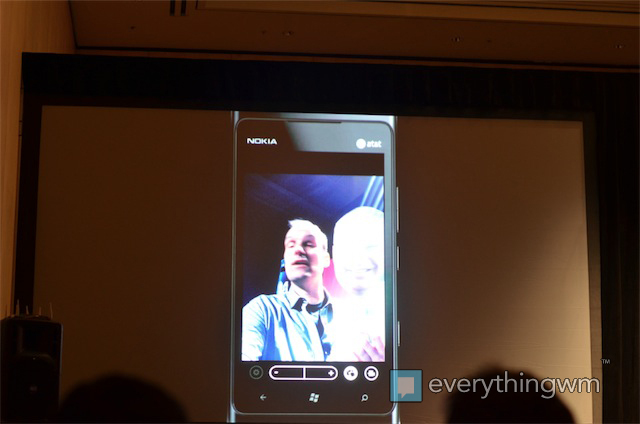 We want to mention that the front facing camera quality looked superb on the Nokia Lumia 900 when demoed during the keynote. 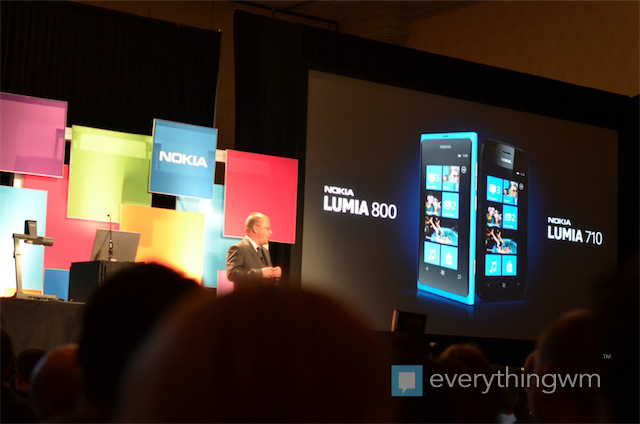 The Nokia Lumia 900 will bring with it custom applications exclusive to Windows Phone Nokia devices (as already seen with the Nokia Drive application and others). 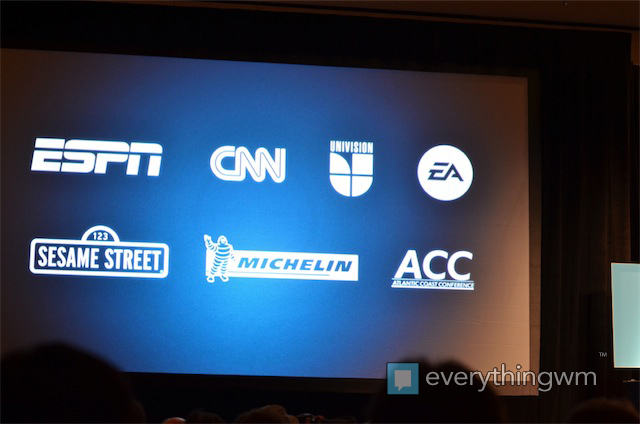 The custom applications shown off were ESPN Sports Hub and CNN. The ESPN Sports Hub shows much more information and is much easier to navigate as custom designed for the Lumia 900, with live tile support also integrated. The CNN custom application was shown off to include the iReport functionality which allows users to submit eye witness reports right from their Windows Phone devices to the CNN website. Nokia is working with other companies such as Univision, Espy and more to bring custom applications to their Windows Phone devices. EA is even working with Nokia to bring 20 exclusive titles to their devices. 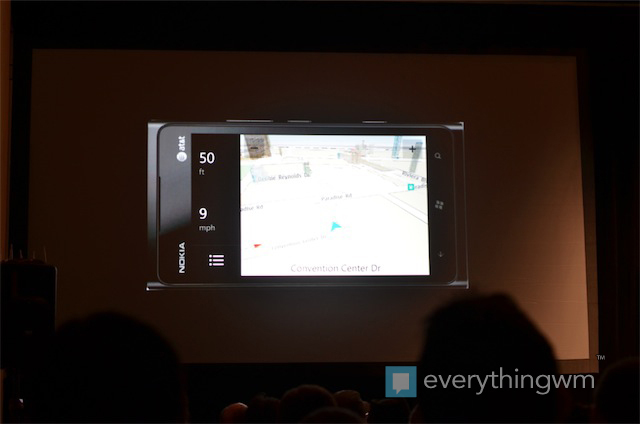 Nokia Drive and Nokia Maps will be updated on the Lumia 900 to include 3D mapping, it is unclear whether the application will be updated to other Nokia devices or if this is a hardware exclusive of the Lumia 900 for the moment. Hopefully all this custom application talk won’t fragment the Windows Phone ecosystem by not being available for other devices at some point. 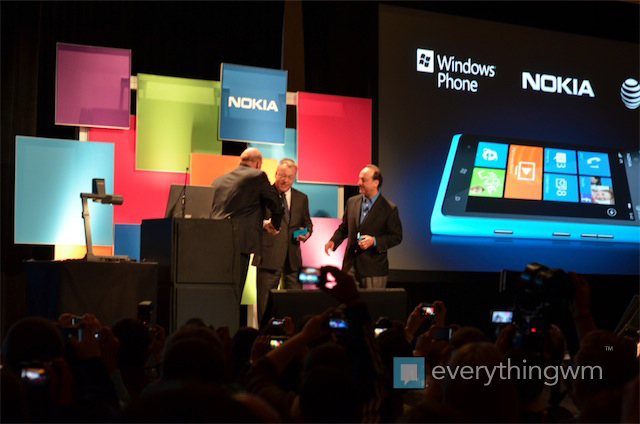 Ralph de la Vega, CEO and President of AT&T, took the stage towards the end of the keynote alongside Ballmer. Between them they stated that AT&T sold the most Windows Phone devices. De la Vega added that AT&T loves Windows Phone and will bring great things for customers in the coming year. 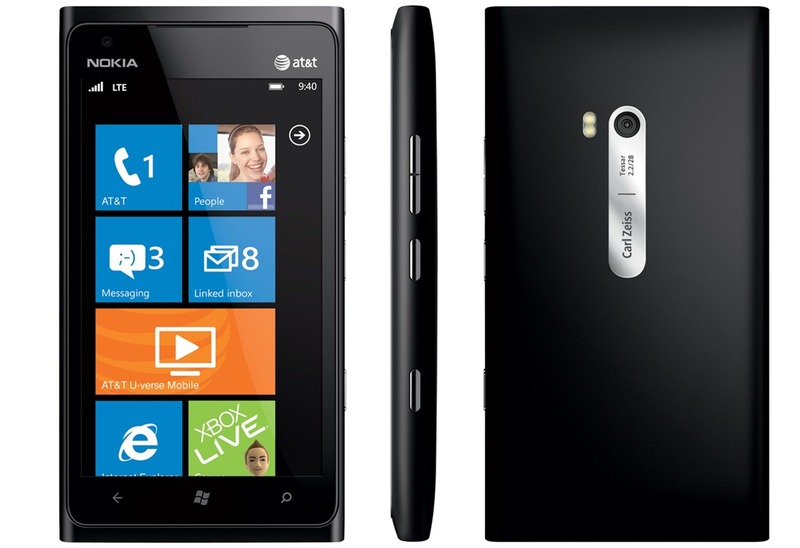 The exclusive and first 4G LTE Windows Phone being the Nokia Lumia 900 is surely a great treat for AT&T users already. De la Vega closed by assuring everyone that release dates and pricing will be announced in the coming weeks. The keynote was closed up with a Q&A by Stephen Elop himself. Answers were quite vague, but Elop mentioned that other OS devices are the only competition and that Nokia is happy for Samsung, HTC and other Windows Phone manufacturers. Elop was asked about storage capacity on upcoming devices and it was dodged with mention that cloud storage is great, with that answer we assume that SD expansion will definitely die down, as it already has after post-first generation devices in most cases. More low end Nokia devices will be released as well for markets in developing countries in the coming year(s) with no specifics on how many. There was no mention of any other devices currently in the works besides the just announced 710 and 900. 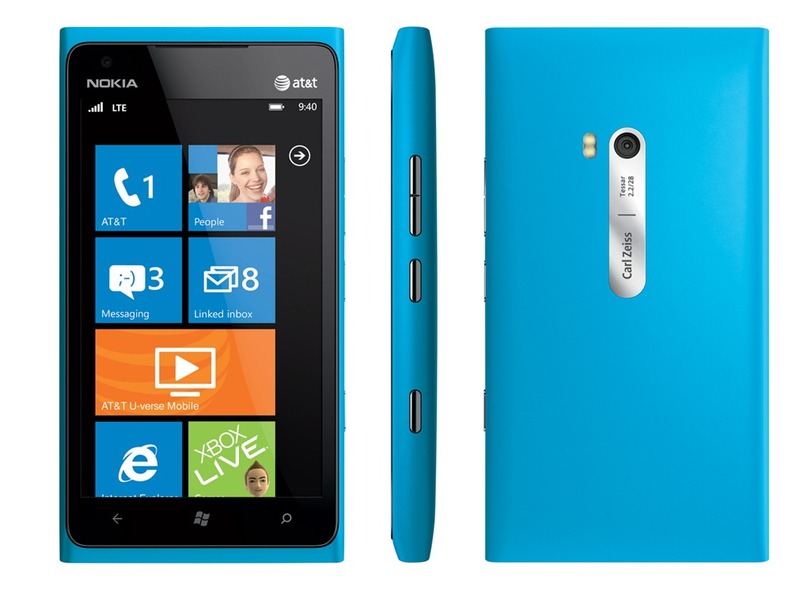 Will you be getting a Lumia 710 or the Lumia 900? Lets us know in the comments below or on the eWM forums! The 900 sounds great. What about the ability to sync to existing iTunes accounts so you don’t have to manage multiple libraries or go through extra steps download media? The road is not so easy for these guys……two giants……Google’s Android and Apple’s iPhone are blocking the road……..